CAIRO – Saudi-led air strikes killed at least 80 people near Yemen’s border with Saudi Arabia and in the capital Sanaa on Wednesday, residents said, the deadliest day of bombing in over two months of war in Yemen. Iranian-backed Houthi rebels seized Sanaa last September and then thrust into central and south Yemen. 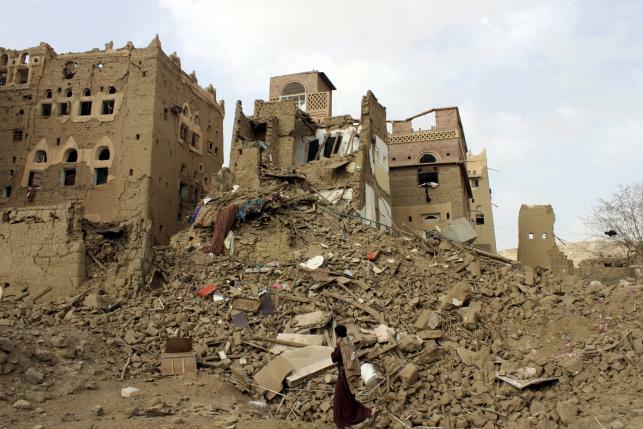 Seeing the Houthi advance as a bridgehead for Iranian influence in the region, a Saudi-led coalition began air strikes on March 26 in a campaign to restore Yemeni President Abd-Rabbu Mansour Hadi to power. Wednesday’s air raids on the Bakeel al-Meer area in Hajjah province across Saudi Arabia’s border with Yemen killed at least 40 people, most of them civilians, local inhabitants said. Tribesmen aligned with the Houthis have been fighting Saudi ground forces in the area, and border clashes have escalated the conflict between the Shi’ite Muslim rebels and the coalition of Sunni Muslim Gulf Arab states. “Houthi gunmen were attacking Saudi border positions from this area but the coalition’s planes failed to hit the fighters and bombed civilians (instead),” one resident told Reuters by telephone. Several hours later, air strikes on a special forces base allied with the Houthis in central Sanaa, the Houthi-run state news agency Saba said, in an account confirmed by residents. “Around 40 people were martyred and more than 100 others were wounded, according to a preliminary toll, in bombing by the Saudi aggression’s planes on the Sabaaeen area in the capital Sanaa today,” the Saba dispatch said. A Yemeni soldier who survived the attack said the raid hit a warehouse where soldiers and Houthi militiamen were receiving their weapons. “So far we’re not sure how many are dead,” the soldier told Reuters. Yemeni army units loyal to former president Ali Abdullah Saleh, forced from power by a popular uprising in 2011, are fighting alongside the Houthis. Arab warplanes and ships also hammered Yemen’s largest military port in the Red Sea city of Hodeida at dawn on Wednesday, a local official said, the most serious attack on the country’s navy in over two months of war. Hodeida and its military bases are aligned with the Houthis, the most powerful force in Yemen’s complex conflict, which also involves southern secessionist militia, local tribal forces and Islamist militants such as al Qaeda’s regional wing. “The naval base was bombed by aircraft and ships. Large parts of it were destroyed and two warships were hit, and one of them, named the Bilqis, was destroyed and sank onto its side, and five gunboats shelled the administrative buildings of the base,” the official told Reuters by telephone from Hodeida. Houthi forces shelled the southern city of Aden, a bastion of resistance against their moves into Yemen’s south, and local fighters built on gains against the Houthis in recent days by seizing their last military post in the nearby city of Dalea. Sunni Arab states see the Houthis as a proxy for projecting the power of arch-rival Iran in the Arabian Peninsula. Yemen’s exiled government in Saudi Arabia has said the Houthis must recognize its authority and vacate Yemen’s main cities before any peace talks can begin.